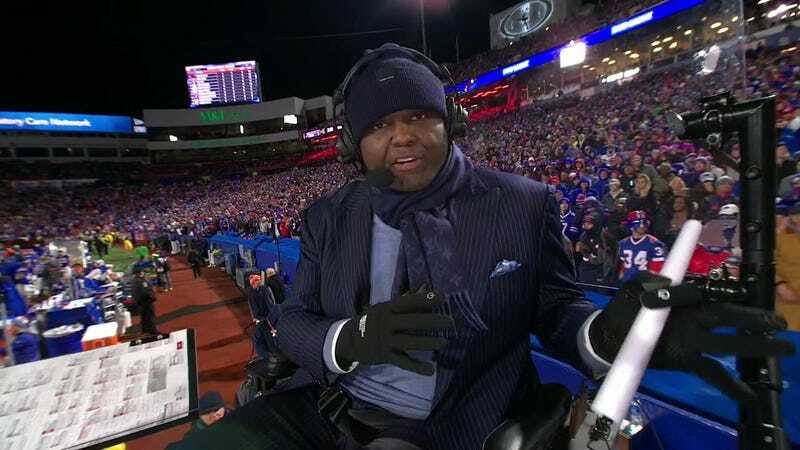 For Monday Night Football games, analyst Booger McFarland is placed in a large contraption that strafes the field so he can get a view of the action that he could more or less get from a sideline camera. The Booger Mobile’s value to the TV viewer is debatable, but what’s clear is that it really aggravates the fans behind it. If you had great seats to a Monday night game, there was a good chance that your view of the field would be obscured at some point by a big TV with ESPN’s broadcast playing. That’s what was on the back of the Booger Mobile. Why see Aaron Rodgers in the flesh when you could watch a much smaller version of him in the cold? Per a source with knowledge of the situation, ESPN removed the monitor that was on the back of the cart based on fan feedback. The decision supposedly came with no pressure from the league. This feels like an unsatisfying solution to the problem. The logical move would be to free Booger, a fine analyst who has his moments, from the big rolling chair. He can rove the sidelines, be in the booth, or sit in some kind of personalized studio/broom closet with all the camera angles he desires. Another option would be to go the other direction and increase the size of Booger’s big rolling chair. Make it enormous, taller and wider than the stadium, the city, the state. Declare it a sovereign nation. People can live in its doodads and thingamabobs, take up jobs, and start families. Soon, we will each have a role to play in the Booger Mobile.